Doing your due diligence when looking for an apartment is crucial for finding a great apartment—like Clover Leaf! At Clover Leaf, we make it easy for you to find your next living space. However, here are a few ways to make your search even easier. Don’t forget these things to bring with you when apartment hunting. A list of questions. This is one of the most important things to bring with you when apartment hunting. It can make the difference between confusion and clarity. Whether you want to know more about the community and amenities or when rent is due, you’ll most likely have several questions. Keep a list of questions on paper or on your phone so you won’t forget! A friend or family member. Two pairs of eyes are always better than one. Let your companion help you by offering a second opinion. A budget. Prior to beginning your search, make a monthly budget. See how much you can afford to spend on rent, gas, utilities, and groceries. Make sure you also account for an emergency fund, if you can. This will give you a good idea of the price range you need to stay in. At Clover Leaf, we are happy to work within a range of budget options to suit your needs. Measuring tape. This item works best if you’ve already measured the bigger furniture pieces that you own. Write down the measurements of your bed, couch, and kitchen table. Then, when you bring your measuring tape with you, you can see how well your furniture will fit into your potential new apartments. A checkbook. When you find the perfect apartment, you may have to act quickly to snap it up. If you have your checkbook with you, you can quickly seal the deal. Then, all you have to do is move in! Apartment hunting is exciting! Remember these things to bring with you when apartment hunting to make your search a breeze. 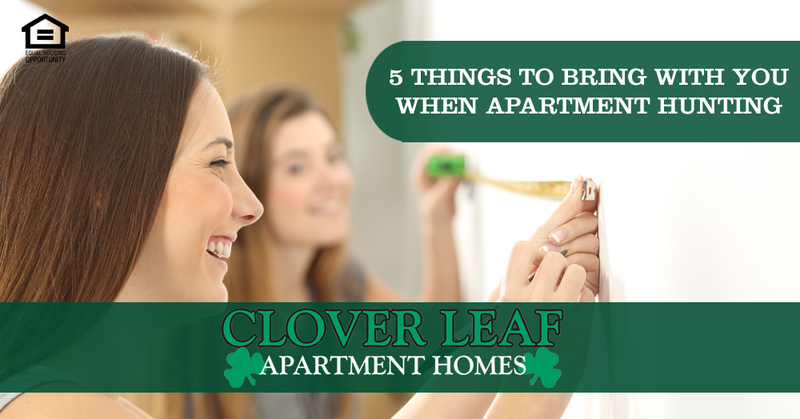 Ready to take a tour of Clover Leaf? Call us at (334) 297-1072 or visit our website at www.cloverleafal.com. Then, you can check out our blog to learn more about apartment living. This entry was posted in Clover Leaf Apartment Homes, Looking for an apartment, Phenix City and tagged things to bring with you when apartment hunting. Bookmark the permalink.